Set designers, budgeters and stage managers won’t appear on stage but are a vital part of UNO Theatre’s production. A wooden door stands 2 inches tall, surrounded by foot-high walls, sitting atop intricately placed cobblestone shards. Wisps of spaghetti-thin plastic vines wrap around steps and climb up the wooden walls. A wire clothesline displays precisely cut paper shirts, pants and dresses. The entire scene can be held in one’s hands. 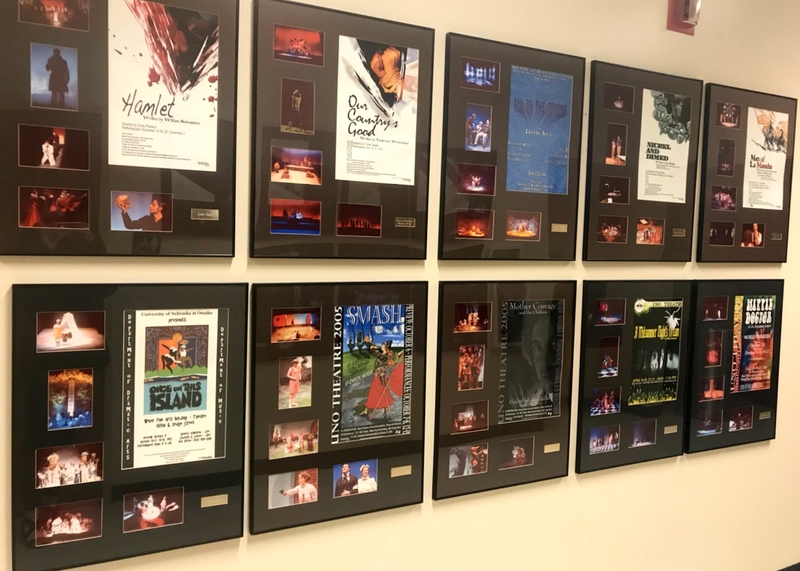 The process of creating shows in the UNO Theatre Department involves a team of behind-the-scenes personnel. The miniature world—the one with the wire clothesline and paper garments—is called a presentation model, and it is the first step to life-sized productions that appear onstage at UNO. These models are built by Robbie Jones, head of scenic design, scenic art and properties. Jones said the process begins with 4-to-12 design meetings where the designers and director work out how the set will look. Multiple models are made throughout the meetings in order to try every possible idea, but the final product is the presentation model, which typically takes between 20 and 60 hours to build. Once the model is finished, Jones said, he undertakes the job of drafting, which can take another 20 to 60 hours. This process involves breaking down the set in its entirety, specifying on paper all the different pieces that need to be built and what they should look like. The process of creating a set does not end after the more than 100 hours that go into the models and drafting, though. Once drafts are completed, they’re sent to Grant Hilgenkamp, UNO’s technical director. Hilgenkamp is in charge of budgeting during design meetings and once Jones’ drafts are completed, his work begins.He creates the shop drawings that include the materials and exact measurements of each set piece. “[Jones] gives me a pretty picture and I figure out how to actually build it,” Hilgenkamp said. Once the drawings are completed, he begins the carpentry. Hilgenkamp said he and several students are tasked with building a set that is both accurate and safe. Thankfully, Hilgenkamp has had more than enough experience when it comes to building. After achieving a degree in technical theater, he worked professionally in a variety of settings including the American Museum of Natural History in Manhattan, the Children’s Museum of Houston and the Heartland Scenic Studio in Omaha. During and after the monstrous project of set building, there is another force at work. Jessie Curry, a student in the UNO Theatre Department, has been practicing the role of stage manager for the past three semesters. A stage manager’s responsibilities range from everyday rehearsals to overall production. Curry said she’s been in charge of safety, cast morale, running rehearsals, facilitating meetings and maintaining the integrity of the show, which helps the production stay true to the original story. A typical rehearsal as a stage manager begins an hour to 45 minutes earlier than everyone else. Getting the rehearsal space prepared and contacting anyone running late is vital. Curry must ensure that everyone is focused and all have the materials they need. She said she announces breaks, informs everyone about scheduling and gives reminders. She also keeps track of the actors’ movement and, if there are no assistant stage managers present, she takes notes about lines and script changes. Despite the heightened responsibilities, Curry said, she still has fun. She plans to pursue this area of theater after she graduates this spring, starting with the Great Plains Theatre Conference. This is a week-long conference held in Omaha where many new and local plays are exhibited. She will manage the show “More than Neighbors” and will get to work with several designers and professors whose classes she has taken at UNO.